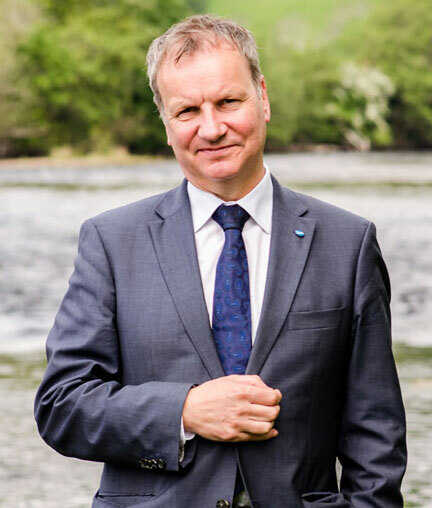 Pete is the Member of Parliament for Perth and North Perthshire and was previously the MP for North Tayside from 2001-2005. The Perth and North Perthshire seat was created after the 2005 Westminster boundary changes in Scotland and takes in East and Highland Perthshire, the City of Perth and the Carse of Gowrie. Matters currently reserved to the Westminster Parliament include foreign and defence policy, fiscal and economic policy, immigration and nationality, energy, broadcasting, Post Offices, social security, Child Support Agency, Tax Credits and pensions. Pete has constituency offices in Perth and Blairgowrie and he consistently ranks as one of Westminster’s hardest working MPs. Born in Dunfermline in 1962, Pete was educated at Queen Anne High School and Moray House College, Edinburgh. He lives in Perth, has one son and enjoys walking in the Perthshire hills. Pete is the SNP’s Shadow Leader of the House of Commons and the Chair of the Scottish Affairs Committee. He is also Chair of the All Party Parliamentary Group (APPG) on Intellectual Property and the Writers’ APPG. Pete is also the Vice Chair of the APPG on Haemophilia and Infected Blood and the APPGs on Music, Beer and the Performers’ Alliance. Prior to being elected Pete spent 15 years in the music business, first as a founder member of the Scottish rock group, Big Country, then with iconic Scottish group, Runrig. Pete has sold over 1 million records worldwide and is the only MP to have appeared on Top of the Pops. Pete is a trained Community Worker and has worked with many voluntary agencies and charities throughout Scotland. Pete is a columnist for the Scots Independent newspaper, blogger and regularly contributes to a variety of political forums. In 2014 he won an award for his contributions on social media. Pete currently plays with the cross party rock band, MP4, raising money for good causes.